Chinese New Year arrives on 5 February, leaving behind the Year of the Dog (and dog it was, in Western terms! ), and ushering in the Year of the Pig. What should you be looking out for in the coming swine-related year? Rooting about for good fortune? The markets got severely mauled in the Year of the Dog, no doubt about it. What will the Year of the Pig unearth? In Chinese culture, pigs are symbols of wealth and good fortune. People born under the year of the pig are generally thought to be optimistic and gentle. But they are also thought to be a touch gullible and over social. On the other hand, they can be very focused and hardworking, which is usually rewarded as long as they don’t get distracted. US policy towards China has irrevocably changed, with the two largest economies in the world moving from partners to competitors. This reintroduces geopolitical risk on a scale not seen since the Cold War. 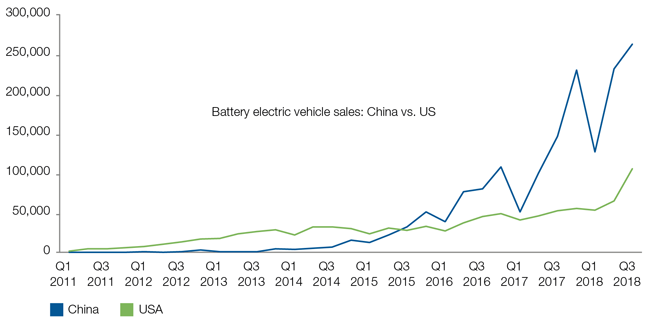 Given the lags in key technologies and China’s need to transform its growth model (see Figure 1) it is likely to accommodate the US in this round. However, China’s domestic businesses are now strong enough to cope with greater openness to international competition, and such competition may paradoxically strengthen them. China’s ‘Belt and Road’ initiatives have also caused strategic alarm for US policymakers. 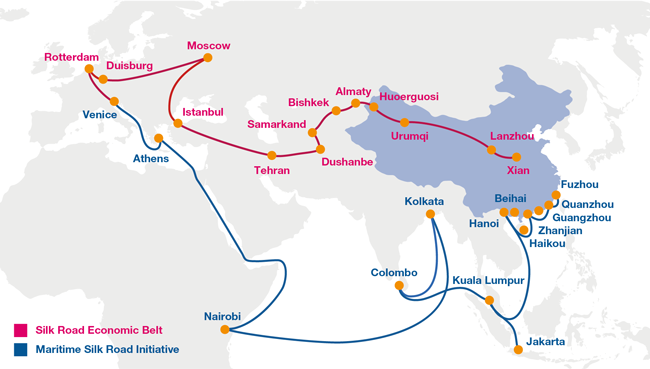 The Belt and Road initiative is only five years old and it’s too early to judge its full results, yet so far many of the projects have not produced positive returns and the associated debt for the recipient countries has become burdensome, reducing likelihood of getting repaid. It will be worth watching how Chinese authorities react to these setbacks, alongside how the US ‘mood music’ towards China’s broad strategic moves shapes international policy. China’s ‘Made in China 2025’ initiative also irked the US. This announced China’s ambition to become world leader in ten globally strategic manufacturing sectors. As Chinese companies accumulate the knowhow and become increasingly visible in the global competitive landscape and go head-to-head with Western firms, corporates and politicians in the developed world may move to protect their existing competitiveness and urge China to position itself on a level-playing field. Through 2019, trade tensions are likely to continue. However, any near-term de-escalation has the potential to provide a catalyst for a relief rally. China’s policymakers are at an important juncture regarding the future of the country and the economic growth model. Arguably the trade dispute, alongside the pressure of high debt levels and demographic issues (among other difficulties), is adding to pressure for the next leg of reform and opening up of markets. Ironically then, Trump’s actions could speed up reforms, making China more competitive in the process. China’s companies are now arguably strong enough to cope with more foreign competition and that will drive standards up. If this occurs it could be taken quite positively by the market. Increasing infrastructure spending, although at a more measured and focused level than previous rounds of easing. Cutting personal income taxes to spur consumption, as well as corporate taxes to improve private corporate sector efficiency. Targeted credit easing: Cutting banks’ reserve ratio and open-market cash injections to reduce interest rates and access to lending. Allowing a certain amount of currency depreciation, at least initially, to counteract tariffs and stimulate exports, then leaning towards currency strength and stability ahead of trade negotiations with the US. We expect stimulus to have a widespread economic effect, helping to mitigate the impact of trade tariffs and stabilise growth. However, tentative signs of a property price correction suggest the risk of a broader slowdown, given the government’s focus on rebalancing the economy away from housing‑related investment. Thus, we remain vigilant observers of Chinese property prices, consumer sentiment and indebtedness growth levels. In our outlook for 2018, the Year of the Dog, we highlighted China’s emergence as a technological superpower, alongside its growing leadership environmental role. These two themes come together as simply part of China’s ‘new normal’, with a broad focus on reform and quality growth, with social and economic benefits. A key focus is on China’s switch to a consumer-led growth model, where low penetration levels leave plenty of room to catch up. Industry leaders are seeing market growth and potential market share expansion, while increasing household wealth is driving consumption upgrades. Source: UNWTO, CEIC, Euromonitor, IWSR, Canadean, UBS, Goldman Sachs, Bernstein, as of 2016. Data rebased: USA = 100%. In our piece looking ahead at the Year of the Dog, we highlighted China’s growing environmental leadership role. President Xi, and the Chinese leadership more generally, know that the serious pollution issues damage party legitimacy. They also appreciate the real-world benefits that will accrue to the Chinese economy by a focus on clean energy and environmental protection. Investors will need to monitor this development closely as it generates investment opportunities, not only in restructuring and reform in ‘old’ economy sectors, but also ongoing emerging ‘new’ economy sectors. The Year of the Pig is likely to be a decisive one in the opening up of China’s capital markets to foreign investors in both equities and fixed income. 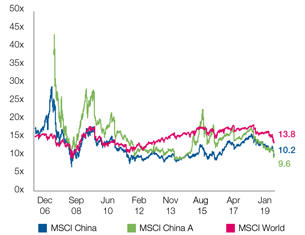 MSCI is currently consulting on whether to increase China A-shares’ weighting in its major benchmark indices from 5% to 20% in 2019. Likewise, on the fixed income side, operational enhancements to ease foreign investor access means that Bloomberg Barclays will start including China in the widely followed Global Aggregate Index from April 2019. 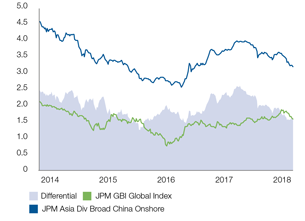 We think JP Morgan could start including China in the GBI EM Global Diversified Index in the second half of 2019, with FTSE Russell to follow with the World Government Bond Index. The growth of the Chinese bond market has been impressive, indeed, it looks set to exceed Japan’s this year. 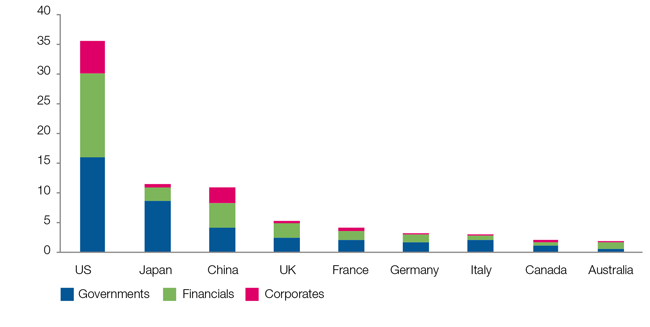 Figure 4: China market size to exceed Japan’s this year. Beijing also plans to grant more approvals to global banks seeking majority ownership in their domestic Chinese ventures. The effort aims to deliver China’s commitment on opening the domestic market and accelerate the participation of professional institutional investors to nurture more mature capital markets. 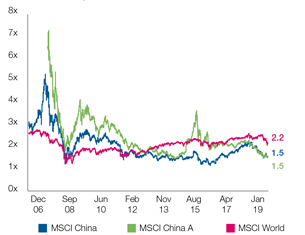 Following a significant pullback in 2018, the Chinese equity market currently trades below its 10-year historical average valuation level from both the forward price-earnings and the price-to-book perspective. The valuation discount versus developed markets has widened despite China’s long-term potential under the new growth model outlined above. 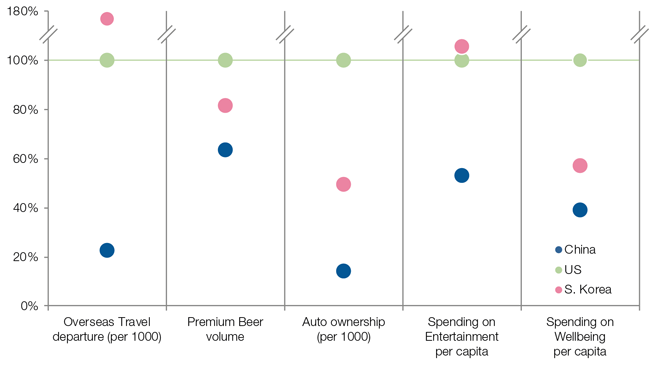 Future growth looks set to be increasingly driven by consumer demand and services, led primarily by the private sector. After being bitten in the Year of the Dog, we believe that private company management appears unduly cautious about the future and could use a bit of the porcine optimism and equanimity. While developed market earnings growth started showing early signs of downside surprise, we believe Chinese corporate earnings will face easier comparison on a year-on-year basis from the second quarter of 2019, as well as support from policy easing. Source: JPM, Bloomberg, Investec Asset Management, 14 January 2019. Market consensus on earnings expectations are slow to reflect the headwinds China has faced. Although consumer sentiment remains weak and uncertainties regarding trade tensions with the US remain, value has started to emerge on the Chinese market, preparing the ground for rally as soon as earnings revisions starts to stabilise. 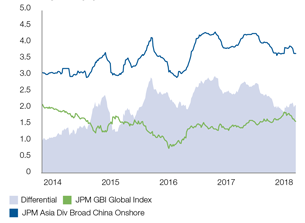 Valuations in China’s on and off-shore fixed income markets are equally attractive relative to history and global peers. Source: JPM, Bloomberg, December 2018. Comprising the JPM GBI Global Index are bonds issued by the governments of Australia, Belgium, Canada, Denmark, France, Germany, Italy, Japan, Netherlands, Spain, Sweden, United Kingdom and United States of America. For further information on indices, please see the Important information section. The long-term investment case for China remains clear and opportunities are emerging in this environment. If we look beyond short-term headwinds, active investors with a disciplined investment process should be able to find quality Chinese companies with good long-term growth potential and decent management. General risks: The value of investments, and any income generated from them, can fall as well as rise and will be affected by changes in interest rates, currency fluctuations, general market conditions and other political, social and economic developments, as well as by specific matters relating to the assets in which the investment strategy invests. If any currency differs from the investor’s home currency, returns may increase or decrease as a result of currency fluctuations. Past performance is not a reliable indicator of future results. Specific Risks: Emerging markets (inc. China): These markets carry a higher risk of financial loss than more developed markets as they may have less developed legal, political, economic or other systems..
All rights reserved. Issued by Investec Asset Management, February 2019.